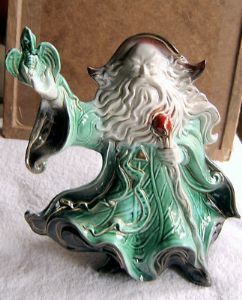 This is a highly collectable Staffordshire Cream Ware Figurine of a magnificent figure of a Wizard. This particular offering represents a product manufacured in the early 19th. Century and has been recreated by Paul Weldon (I think) for the existing Staffordshire Pottery. It is signed and backstamped underneath. The figure, respendent in a turquoise and emerald green flowing robe stands 11.5 inches (29 cms) tall with a width of 9.5 inches (24 cms). It is in perfect condition.